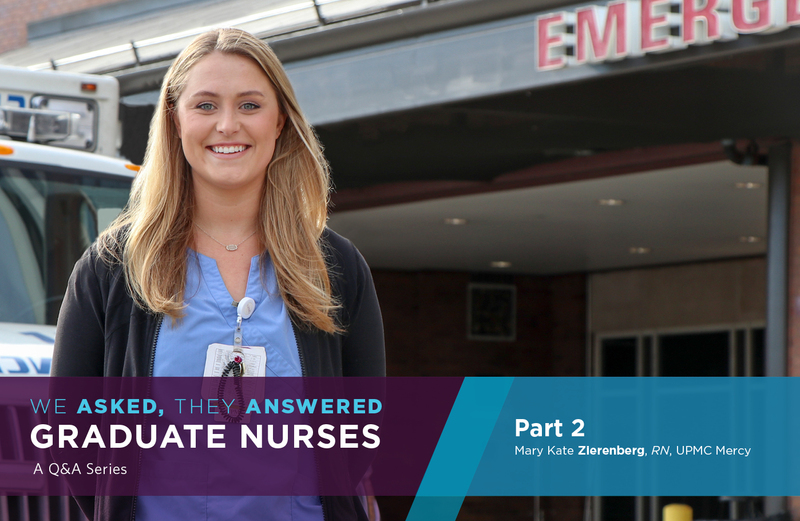 Next up: Kate Zierenberg, a nurse at UPMC Mercy Emergency Department. Kate, why did you decide to become a nurse? Kate: Growing up as a child my parents had two very different professions: My father worked in a laboratory and my mother was a teacher. While watching them thrive in their respective careers, there were aspects of both that interested me. I loved the science behind my father’s work, but admired the way my mother dedicated herself to others. Nursing was the perfect career for me to combine the two. Kate: I received my Bachelor’s of Science in Nursing from the University of Kentucky. During my time there I experienced what it was like to work in a large university medical center of Magnet status. That led me here! Kate: Though I enjoyed my time in Lexington, I am a Pittsburgh native. Even prior to earning my degree, it was always my goal to return home and work for UPMC. I also completed a student nurse internship with UPMC prior to graduation. It was clear during that time how devoted the staff was to patient centered care and successful outcomes. The 10 weeks of intense clinical experience remain some of the most rewarding of my early nursing career and are ultimately what led me back to UPMC. Can you tell us more about your internship with UPMC? Kate: My 10 weeks were spent in the emergency department. I got to work closely with our physicians – it was team oriented, collaborative, and there’s trust and great communication. That trust and mutual respect with my co-workers made it such a better environment to take care of patients. Everyone was devoted to the common goal of successful patient outcomes. 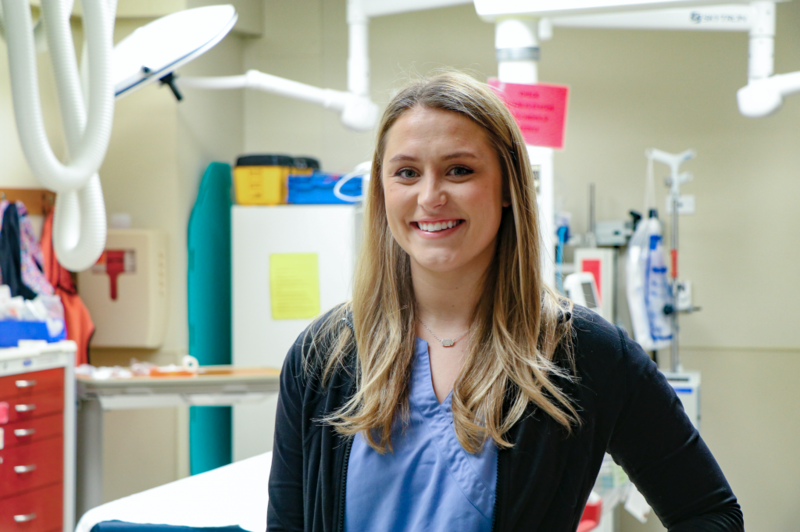 Kate: Transitioning from a student to the role of a nurse was more difficult than expected, but thankfully I had amazing coworkers who helped and guided me through the transition. The support I received from my onboarding team helped me feel comfortable starting in my role and growing in my role. I never felt uncomfortable asking a question or asking for help, people were always pulling me in to learn something new and be challenged to take the next step in your career. UPMC really provides a good foundation to grow on. All new graduate nurses that start at UPMC participate in a year-long nursing residency program. What’s that been like for you? 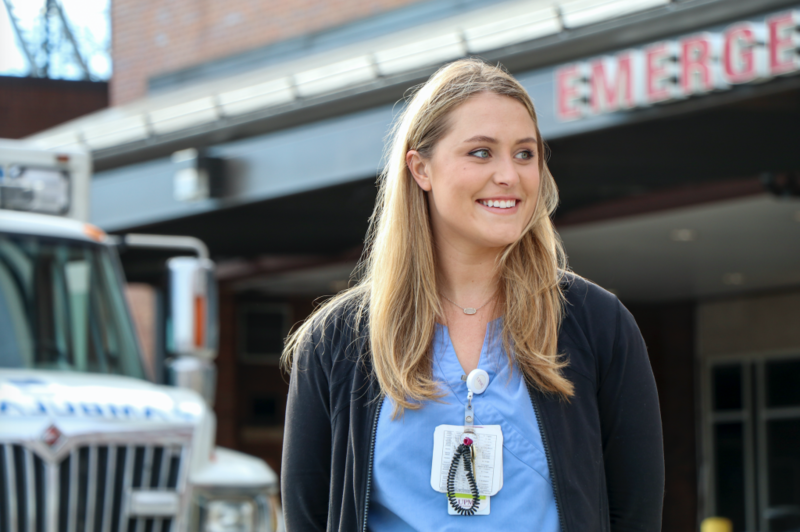 Kate: I think a highlight for me is when I get to gather with other new nurses once a month for a discussion we call “Tales of the Bedside.” During this time, all the new nurses who are in the nursing residency program get to share the highs and lows of what’s going on in their transition. It’s nice to know that you’re not alone in some of the challenges of clinical care or adjusting to a new work environment, and it’s great to be able to celebrate our successes together. We also undertake and develop an “evidence-based practice” project with other members of our cohort. This is one of the things that pushes you towards improvement. We present our findings later on, and sometimes the projects and findings are implemented in hospitals. It’s neat to know that your voice does matter and your practice does matter – even a new GN has the chance to make a difference in a department. Kate: There are many things that I enjoy in my current position as a staff nurse in the emergency department. There is a very diverse patient population with a wide variety of health problems. It’s crucial to be able to both assess and intervene quickly in the emergency department, as patient condition can change at any moment. I also take pride in the team I work with at UPMC Mercy. From physicians to respiratory therapists, techs, and fellow nurses, I know that when a situation becomes critical I will never be alone. As a new graduate nurse this was imperative to my success in the ER. I felt comfortable challenging myself in these situations because of the resources available and the support from my colleagues. As nurses, we are invited into people’s lives each and every day. We are privileged to be able to share these intimate moments, whether good or bad, with our patients. Working as a nurse at UPMC, I know I have the best foundation to provide the highest quality care that every patient deserves. Kate: Right now I am most looking forward to continue growing as a new nurse. In the future I am hoping to obtain my CEN (Certified Emergency Nurse) and completing my TNCC (Trauma Nursing Core Course). In time I hope my experience in this department will allow me to identify ways we can improve our department and initiate changes that impact patient care for the better. Any other advice for a graduate nurse starting their career with UPMC? Kate: We are so fortunate as a unit and hospital system to have the many resources that we do. There is never a doubt in my mind of whether I have the means to provide the care that is necessary. On another note, the fact that we are an academic medical center truly drives our practice. A new perspective is always welcome and we are adopting and changing practices everyday. Bring your fresh ideas forward! Feeling inspired to become a nurse at UPMC? Learn more about the opportunity for GN’s to earn up to a $5,000 sign-on bonus with eligible full-time and part-time nursing positions with UPMC.